What Is The CPNE Test? What Are The Requirements For The DOUBLE Your Money Back Guarantee? If my videos and EBOOK do not get you through this test then simply send me your "notice of failure" sheet given to you by the CA and I will REFUND DOUBLE THE MONEY THAT YOU PAID FOR THE VIDEOS. Since April 2008 I have only had ONE person ask for a refund (through no fault of the videos). If the videos/documents are directly responsible for your failure then you are eligible. and I FAILED! (grand total for my first CPNE was $2789.00). I felt that the only thing that people wanted from me was money and I was sick of, "higher learning establishments". The reason the cost is so low is because I know how expensive this process can be and I understand where you are coming from. If there was a website out there that was like this one I would not have hesitated to buy an actual VIDEO of someone doing the areas of care so I could go into the CPNE with CONFIDENCE. Instead I had to buy someone's notes on EBAY for $100.00 that turned out to be worthless. Why Do You Use Mnemonics With Pictures? I consider myself a reasonably smart person, but I have a horrible memory. I learned a long time ago that people think in pictures. This is why apple computers are so successful. They have a bunch of little icons that represent a lot of different information. TIME to check Color of skin. Color= Change In Skin Color. The picture is a persons arm from the elbow down and it is covered with hives. On the wrist is a watch and it is causing you an unbearable itch. If you think of this picture, the mnemonic "comes alive". Pretty simple, right? Believe me when I say it is much easier to remember a MNEMONIC that is ASSOCIATED with an Area Of Care than to remember a Long Checklist. 1. How Do I Control My Nerves While Taking The CPNE? - As you get closer to your test date start increasing the amount of times you perform your critical elements on your dummy. do it to the point that you become sick of doing them. At the point when you do the critical elements, and you can do them with ZERO mistakes AND they are second nature where you don't even have to see the picture of the mnemonic, then you will be ready. I felt when i went to take the test the second time that I wasn't just there to pass, but to go into the patients room and see how fast and accurate I could do the critical elements on the patient. It allowed me to stop thinking of "what if i fail" and changed my mindset to " lets see how fast i can blow through this test". With that mindset it took the pressure off enough to be successful. Good luck. 2. How Much Studying Should I Do? You will notice that on the last week you do LESS. This is because you should have one the lab sims and the critical elements that they will be SECOND NATURE. Too much studying at this point would not be beneficial. Also, the first weeks it will take you a long time to do all the critcial elements on the PCS and the lab sims. As you become more proficient you will notice that the time it takes you to do EVERYTHING drastically reduces. For example: It would take me no more than 15 minutes to do the PCS critical elements on my dummy and no more than 15 minutes to do all 4 lab sims. 3. What Does OFFLOADING Mean? Offload means to reduce pressure to the skins surface. for example, when you put a patients legs on a pillow while in bed and their heels are suspended above the surface of the bed you are "floating the heels" and thus "offloading" the pressure from the heels. The same can be said as you roll the patient off their coccyx and put them on their left or right side. You have just "offloaded" the pressure from the pts coccyx and thus they will not get a bed sore. As you can see in these examples "offloading" is just a term to describe how you reduce pressure. 4. Where Do I Put My Paper Down To Record Things Like Vital Signs And Assessments? Did You Use A Clipboard? I never put down my clipboard because I never used one ! Here is the thing, before the Implementation phase the CE will tell you where you can set down your papers to do any charting. Some may tell you the patients table is acceptable, others may say the counter at the front of the room or whatever they deem acceptable. What I did was simply roll up my papers and put them into my back or side pants pocket. When I needed to write something down that was important like vital signs, ABNORMAL assessment findings, things the patient said, etc., then I would take my paper out and jot the notes down (remember to take off your gloves before you chart anything). 5. Will The Examiners Write Down If I Have To Take An Apical Pulse/BP Before Administering Meds? 6. If My Patient Has A Bowel Movement While Wearing Depends Undergarments, Are You Responsible For Changing Them? 7. The Plunger On My Syringe Felt Like It Was Welded In Place. What Can I Do To Make These Lab Stations Go Easier In Regards To Working With The Syringes? 8. The Gloves Were Horrible Or Did Not Fit Me When I Went To Do The Lab Sim Portion Of The CPNE. How Can I Rectify This The Next Time I Go? 9. Do I Need To Re-do The 20 Minute Checks Each Time I Re-enter The Patients Room ? 10. In Regards To The Patient IV - If We Aspirate And We Do Not Have Blood Return But Our IV Site Looks Good And It Flushes Without Difficulty, Do We Have To Tell The CE Or Just Continue?
" If the IV has no blood return but site looks OK, you can continue to flush. During the flush if the area above the IV insertion site becomes swollen or patient complains of pain you must stop and inform primary nurse, if not continue to flush total amount of required flush medication." 11. What Are Some Of The Most Common Nursing Diagnosis To "Tag" On My Nursing Diagnosis Book? 12. What Is The MAXIMUM Amount That I Can Inject Into The Vastus Lateralis Muscle For The IM Injection? Depending on where you get your information this answer varies. HOWEVER, Excelsior College uses the book: Kee, J.R., et. al. (2009).
" Intramuscular Injections: Needle size 20-23 gauge, 18 gauge for blood Needle length 1.5 inches." Technique: Same as sub q except flatten the skin area using the thumb and index finger and inject between them. Insert the needle at a 90 degree angle into the muscle. 13. What LENGTH and GAUGE needle do I need for the Subcutaneous and Intramuscular Injections ? As this information is not located in the CPNE guidebook (specifically what gauge needle is to be used) then we must look at the recommended textbooks. As the book, "fundamentals of Nursing: The art and science of nursing 7th edition, Lillis, LeMone & Lynn is reference on page 441 of the CPNE guidebook, 21st edition, this is considered an acceptable reference. Equipment used for a subcutaneous injection includes a syringe of appropriate volume for the amount of drug being administered. A 25- to 30-gauge, 3/8 to 1" needle can be used. The 3/8 and 5/8" needles are most commonly used. Choose the needle length based on the amount of subcutaneous tissue present, which is based on the patient’s body weight and build (Annersten & Willman,2005). Usually, no more than 1 mL of solution is given subcutaneously. IM injection needle size: Vastus lateralis 5/8 to 1"
Generally, biological agents and medications in aqueous solutions should be administered with a 20- to 25-gauge needle. Medications in oil-based solutions should be administered with an 18- to 25-gauge needle. 14. Do you inject at a 45 or 90 degree angle when giving lovenox or insulin subcutaneous in the abdomen? As this information is not located in the CPNE guidebook then we must look at the recommended textbooks. As the book, "fundamentals of Nursing: The art and science of nursing 7th edition, Lillis, LeMone & Lynn is reference on page 441 of the CPNE guidebook, 21st edition, this is considered an acceptable reference. Subcutaneous injections are administered at a 45- to 90-degree angle. Choose the angle of needle insertion based on the amount of subcutaneous tissue present and the length of the needle. Administer the intramuscular injection so that the needle is perpendicular to the patient’s body. This should ensure that it is given using an angle of injection between 72 to 90 degrees. 15. 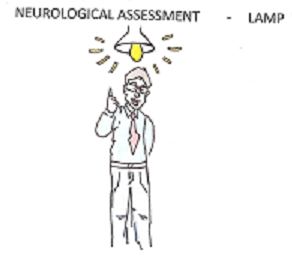 How Do I Assess An Infant, Toddler And Non Communicating Adult's Neurological Status (LOC). I Know That The Critical Elements Are To Assess The Tactile, Auditory, And Visual....But What Do I Do? Visual stimuli - How did the pt. respond to a familiar toy ? To their parents faces ? Tactile stimuli - "tactile = touch". How did the infant respond when you touched his/her_______? 16. What Feedback Have You Heard About The Testing Site At NY, WI, TX? Is It A Good Place To Test? 1) There were different groups of examiners from one week to the next. Remember, just like when you go to a restaurant - sometimes the food is made by the top chef at the restaurant and the food is excellent so you say the restaurant is excellent and recommend it to a friend. That friend goes the next week and gets a different chef and the food is horrible, so the friend states that the place is horrible...It is the same way with testing sites. 2) The student was not prepared and because of his/her lack of preparation states that the site was "unreasonably hard". Let's be honest, sometimes this DOES happen. Does it happen ALL the time where the student was unprepared and the examiners were supportive, understanding people? Hardly, but it does happen. My recommendation is forget the good site/ bad site and instead focus on being CONFIDENT ! If you can show these examiners that you can perform these simple assessments and tasks then they will have no problem passing you and letting you practice as an RN in the outside world. When I was going through LVN school in the U.S. Army an instructor told the class that his son was in Iraq and the only way he would pass us is if he felt that we could take care of his son if he was injured and we were taking care of him while he was in the hospital.
" Pass the ones that are competent and ones that YOU would let take care of people on the outside as an RN. " Makes sense doesn't it ? 17. I Just Got Back From One Of The Test Sites And I Failed!! This Test Is IMPOSSIBLE!! How Do I Get Through This? First let me say I am sorry that this happened to you. It happened to me too as well as happening to thousands of other students. Here is the deal - This test can be passed by just doing these critical elements over and over again until they become second nature. Let's look at it like this - If the critical elements take up 80-90% of the test and you do them 100% accurately when you practice at home then you should already be 80-90% to the finish line. Now then, when some unknown pops up - like the patient is vomiting, or the patient left the room to get an X-ray you will only have to deal with these outliers that happen 10-20% of the time. The ones who get flustered with this test are the ones who cannot do the critical elements effortlessly. Then, not only do they have to worry about these 10-20% outliers, they also have the added pressure of thinking to themselves, "I hope I don't mess up this respiratory assessment" (or whatever area they were assigned that they cannot do 100% accurately). That is really the secret. Eliminate the problems that you can, (critical elements, lab sims, nursing care plan interventions) so when you are faced with unknowns (outlier problems) you are not adding any undo pressure. The videos and documents cover how to do all of these processes. Don't worry - many people have failed and come back to pass and you will too ! 18. Do I Have To Wear Gloves AFTER Assessing The IV Site And BEFORE I Assess The IV Tubing? "You must take gloves off AFTER assessing the IV site, then check the IV tubing for air after gelling. Rationale: asepsis, moisture vapor can escape and be transfered to the tubing, which is a clean, non-gloved area/field to be working." So there it is, the tubing is considered a non-gloves, clean area....This only applies if you have to assess tubing after you check the IV site. The IVP (IV push) station you would not have to take off your gloves. 19. When I Am Packing The Wound In The Lab Sim Station Can I Use More Than ONE Piece Of Gauze? 20. When Performing Teaching Are You Assigned What To Teach? Also, Where Do I Get The Information To Teach And For How Long Am I Expected To Teach? With Teaching the student is expected to find something to teach the patient on. You can see examples of teaching in the members area for all AOC's. I remember for my teaching I had incentive spirometer. If I did not know how to use an incentive spirometer or its' purpose, I would have grabbed a respiratory therapist on the floor and asked OR I could have taken a look at one of the fundamentals of nursing books that are available to you at the nurses station and looked it up. 2) Ask the patient what he/she knows about the subject - i.e, is there something the patient does not know that needs to be taught ? 3) After you have taught the patient make sure they understand what you told them by asking, "Mr. smith, what can you tell me about what we just talked about ? 21. Where Can I Write Down My Mnemonics When I Am In The Planning Phase Before I Go Into See The Patient? You can write your mnemonics down in numerous places like a scrap piece of paper which you could ask for, or just do what I did and write your mnemonics on the back of your PCS recording form. You are going to be writing everything down that you do on the FRONT of this paper so why not write your mnemonics down on the BACK of the paper. Remember, you CANNOT write anything down BEFORE you get into the planning phase. To bring in a "cheat sheet" with mnemonics on them would be cheating. 22. What Is The Difference Between The Planning, Implementation, And Evaluation Phase? "PLANNING" phase - You will write up your NCP (nursing care plan), do your grid, review the patients chart and talk to the patients primary nurse. You will hand in your NCP (nursing care plan) and the examiner will ask you if you "have completed the critical elements" You say yes, and the examiner reviews the NCP to make sure there are no HUGE errors ( you shouldn't have if you follow my NCP guidelines). He/she will then say "you have passed the critical elements for this section, you may proceed." You will now enter into the Implementation phase. "EVALUATION" phase - You are then going to go outside and chart on everything that you did (or finish up on your charting - some students will chart as they go like me). You will write up your NCP with evaluation and rationale, complete the recording form which will have sections for you to chart on what you did for each critical element and then turn in the paperwork when you are done. Before you turn in the paperwork you need to re-check your grid and see if you completed EVERYTHING. This is the reason for writing up the grid. If you did not complete all tasks you tell the examiner that you need to go back in and finish up something. If you are done and hand in the paperwork the examiner will then ask you if you have completed all the critical elements for this section. You say yes, hand in the paperwork and relax because you know that you did your best. 23. Do You Document Your Findings As You Go On The RECORDING FORM Or Do You Put It On Your GRID? You can document little notes about the patient anywhere you want. For example, if I go in and find redness on the patients coccyx, I would probably make a note of that somewhere to remind me to chart that the patient had redness on his coccyx as this is abnormal. I feel the best place to put that note would be on your grid because you know it will be there when you go back to chart because you MUST look back at the grid to check off if you performed the assessment AND if you charted the assessment. (LEFT side is a check mark that you DID the assessment/action, and the RIGHT side is when you CHART it. So as you look back at skin assessment and you are checking off COLOR, you would see your little note right there that states that the COLOR of the patients coccyx was reddened. A: NO. On page 58-59 of the 22nd guidebook, there is NOTHING that states you have to COMPARE both extremities, it all depends on what extremity you are assigned (you could be assigned ONE or MULTIPLE extremities). Do not get MUSCULOSKELETAL MANAGEMENT confused with PERIPHERAL NEUROVASCULAR MANAGEMENT and/or NEUROLOGICAL ASSESSMENT. In Peripheral NeuroVascular Management you must compare BOTH sides of the extremities for Color, Cap Refill, Motor Function, Sensation, Temperature, Pulse Quality and Edema (pg. 64) and in Neurological Assessment you must compare strength/motor response in upper AND lower extremities by having the patient SQUEEZE your fingers with both hands and Dorsi/Plantar Flex both feet against resistance. 25Q: For the 20 minute checks - We don't have to document oxygen flow rate at all, just verbalize that we have verified it is flowing at correct rate? A: On pg. 62 in the CPNE guidebook it states, "CONFIRM oxygen delivery rate within the first 20 minutes after beginning the Implementation Phase." That means you ONLY have to CONFIRM it not have to DOCUMENT within 20 minutes. Now you will have to DOCUMENT the LPM at some point under OXYGEN MANAGEMENT but that can be at ay time in your 2 1/2 hour PCS. 26Q: Fluid management and we are assigned I & O......I see in the upper right hand corner where we would put output, but nowhere to indicate it was via foley. Would we just include that in the FLUID MANAGEMENT CLINICAL NOTES when we describe output characteristics? A: On page 51 it states to assess the integrity of system - Indwelling urinary catheter and on page 52 it states to DOCUMENT ON FLUID MANAGEMENT FLOW SHEET the TYPE of drainage device. So, I would put it in the FLUID MANAGEMENT SHEET under "DRAINAGE SYSTEM" and then the sub-heading of "TYPE Of Device". 27Q: when doing the "up the arm, down the arm and around" , do we need gloves to visualize the mucous membranes in the mouth? Im thinking we check IV with clean gloves, remove them, gel hands then begin with hydration status check. do i have that correct? 28Q: Do we do one assessment, chart then go back and do another or do all assessments while in the room once then come out and chart? 29Q:Can we make notes while in the room? 30Q: Can we go back to check something if we miss it? A: Yes, you can go back if you feel like you missed something....just as long as you have everything and I mean everything done in you 2 1/2 hours! 31Q: How do we weigh diapers? A: Zero an empty scale that uses gram measurements. Place a DRY diaper on the scale, zero the scale again, remove the DRY diaper. The scale is now ready to measure a wet diaper. To measure the WET diaper, place a paper towel barrier down first, then place the WET diaper on top, and measure the grams. Grams translate to milliliters (1 gram = 1 ml) for your I & O chart. If you're unable to zero a scale, you can weigh a DRY diaper, then place a paper towel barrier down and place the WET diaper down and subtract the DRY diaper weight from the WET diaper weight (ex. DRY diaper weighs 4 gms, WET diaper weighs 16 gms so this would give us 12 grams of urine or 12 ml of urine as 1 gram = 1ml). 32Q: How do we measure ice chips as intake?